The HEA team has extensive economic modelling experience for both petroleum and renewables projects gained in operating companies and the financial services and consulting sectors. The HEA team can assist your company from reviewing your existing models and calculations through to bespoke analysis for a specific project or asset or building a new economic model. We also offer guidance and support on economic input parameters, fiscal terms and methodologies. Our experts provide financial modelling services to companies investing in the energy sector as well as host governments, regulators and trade associations. We assess the economic and financial impact of commercial, contractual, fiscal and regulatory arrangements as well as project technical assumptions. We have experience in developing robust, understandable and flexible economic models which allow clients to understand the impacts for them of changes in assumptions and the impact on future cash flow as well as the use of alternative financing structures. This analysis can help to optimally structure projects and manage risks. Asset and portfolio valuations and analysis and guidance on how to maximise value. New Model design and build. Risk and Uncertainty analysis and Probabilistic economics. Asset/Hub/Area/Country strategy development and portfolio reviews. 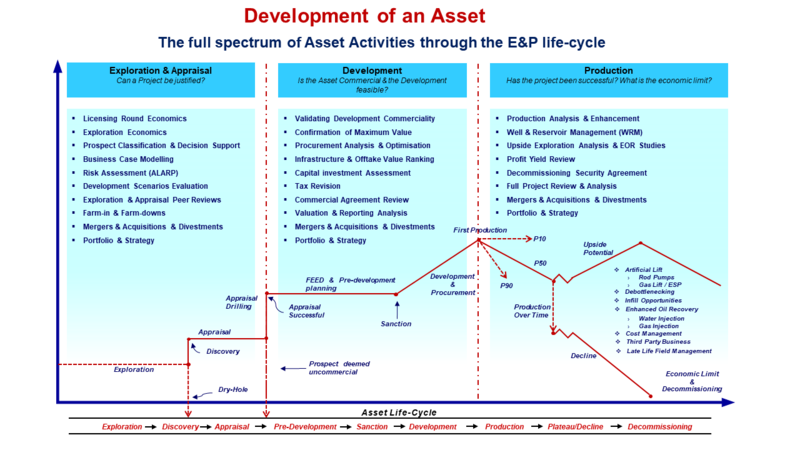 Economic analysis for project investment decision making and post investment reviews. Supporting projects with analysis where commercial decisions need to be taken. Modelling for reserve booking and business planning and strategy projects. Economic Limit testing and end of life planning and decommissioning provision modelling. Supporting internal and partner approval of investment decisions. Providing commercial input into new agreements for transportation, processing or product sales. Consolidate technical/subsurface, engineering & financial data on assets into the valuation process. Economic modelling and analysis to support bid/licensing rounds and MA&D activities. Tariff and Price escalation and reopener calculations. External model validation or independent third party review of analysis. Expert Witness and Dispute Resolution modelling and support. Secondment of staff into client teams/projects. Tax modelling analysis and integration.